I posted this to coldairings.luftonline.net yesterday – which is hid (to me) by gremlins this morning – so I am repeating the post here. A couple of weeks ago I wrote on why the IESO’s reporting of “Ontario demand” isn’t reflective of actual demand in Ontario. Embedded generation is lowering the demands on generators feeding directly into the IESO’s grid – and because much of it is solar, the IESO is reporting lower demand during sunnier hours. 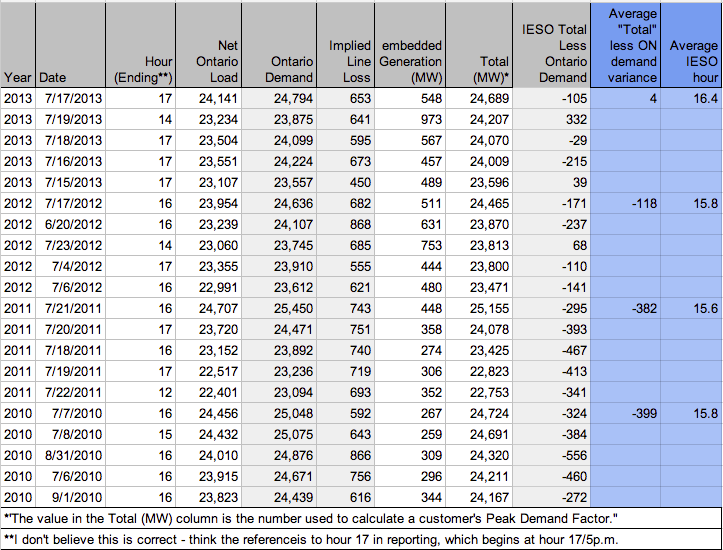 Omitting embedded solar generation has changed the demand profile indicated by the IESO’s reporting. Today is a good example of what’s happening and how it can impact the hours chosen to determine global adjustment shares for Class A customers, which are implemented to allocate significant charges for an entire 12-month billing period. “Load” is estimated here to estimate line loss and legacy embedded sources – and it still peaks in hour 16 or 17, as it always has. The same forces can be seen adding IESO “Ontario Demand” values to the numbers shown for “Coincident Peaks” on the IESO’s site. As the years move on, line loss isn’t changing, but the actual load has gone from being 400MW below demand, in 2010, to about even last year, and will like be far above demand in the summer of 2014. 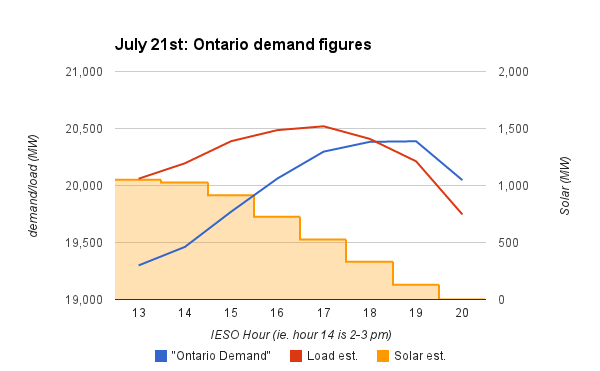 In addition to the “load” increasing to where it is now greater than what the IESO has been calling demand, the hour that the IESO considers “peak” is also moving away from the hours where solar is most productive. “Load” is only requested for the high 5 peak hours. The IESO recently produced this Backgrounder on the ICI program (class A); it doesn’t deal with the issue that their peak isn’t, increasingly, indicative of the real demand peak.